LACBC’s Planning and Policy Director, Eric Bruins shares news of his meeting as 90042 resident and new LACBC Executive Director, Tamika Butler listens. On Wednesday, February 6th, the Los Angeles County Bicycle Coalition held a Northeast LA Bike Ambassador meeting at the Audubon Center in Debs Park to share details of their meeting with District 1 Council Member Gil Cedillo‘s office regarding North Figueroa. At Council District 1’s request, LACBC’s Planning and Policy Director, Eric Bruins met with Gil Cedillo’s staff the first week of January just before we held a die-in outside his alleged residence. 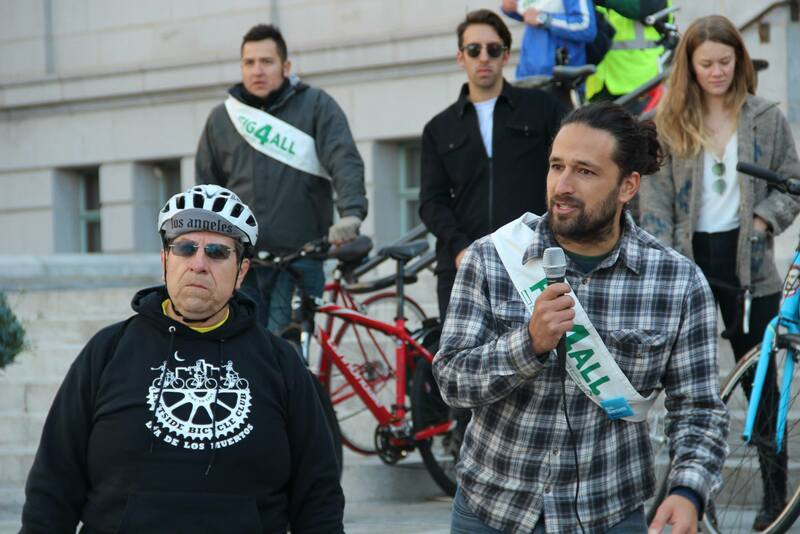 This follows the December City Council Meeting where Figueroa For All supporters went en masse to denounce his plans to prevent bike lane installation with diagonal parking. This is where Gil Cedillo responded by calling us “Bullies” for challenging him. Bruins spoke very kindly about Team Cedillo, and how from their perspective, they came into office with the impression that they had a “clean slate,” unburdened with the already approved plans in their newly acquired district. He also mentioned that from their perspective, they are “mystified” as to why Figueroa road safety advocates are so upset. 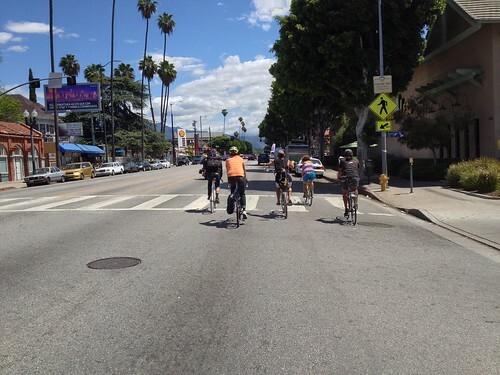 According to Bruins, Team Cedillo is planning to apply for a May 2015 State of California Grant that could provide funding in late 2017 for Complete Streets features on North Figueroa between Avenue 55 and 60. (This section of Figueroa has already been selected to be part of Mayor Eric Garcetti’s Great Streets Intuitive.) 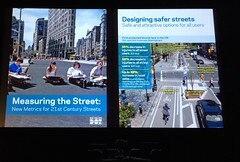 Of the three options offered, two of them include a road diet with bicycle accommodations. 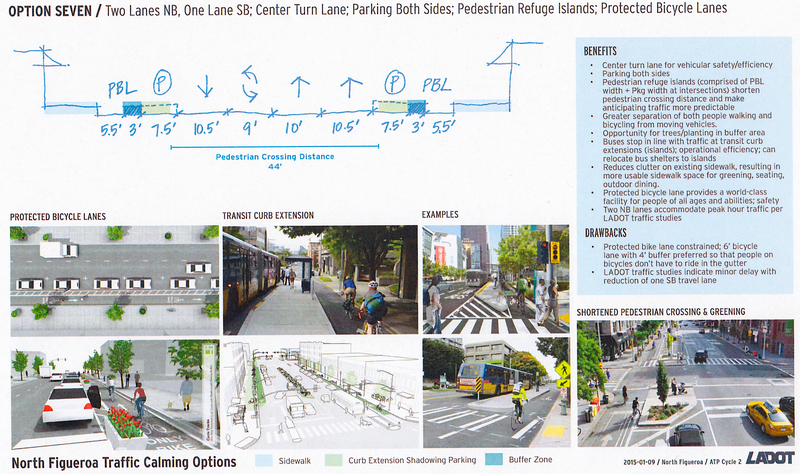 Team Cedillo Phase 1 plan for five blocks of North Figueroa with help from LADOT and uncredited photographers. This latest development from Gil Cedillo’s office is proposed as a pedestrian project only. (They really really dislike bikes.) Apparently, the data on pedestrian deaths is finally getting through to them. (Maybe more cyclists have to be struck and killed on Figueroa before they start considering bikes too?) This Livable Streets awakening has inspired Team Cedillo to create a plan with help from LADOT for curb extensions on Figueroa that would reduce the crossing distances for pedestrians. By reducing the crossing distances to accommodate pedestrians, it could also create room for non-motor vehicles users such as people using bicycles in a bike lane. This approach would actually leap-frog one of the original reasons for the Figueroa buffered bike lanes in the first place: To make the road narrower so people using their feet have less area to cross in front of people using their cars. 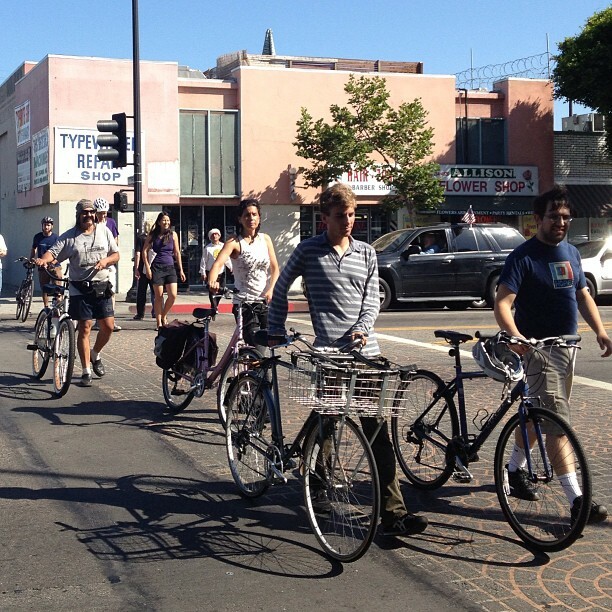 The main fiduciary difference is that the original Figueroa buffered bike lanes could accomplish the same goal with transportation funds already paid for by Measure R. Instead, Team Cedillo is betting on a long-shot California State grant to do similar at a much higher price for just five blocks of North Figueroa. Five whole blocks of Complete Streets infrastructure that ignore the 36 other blocks of Figueroa in CD1 where most driver verses pedestrian / cyclist collisions occur. 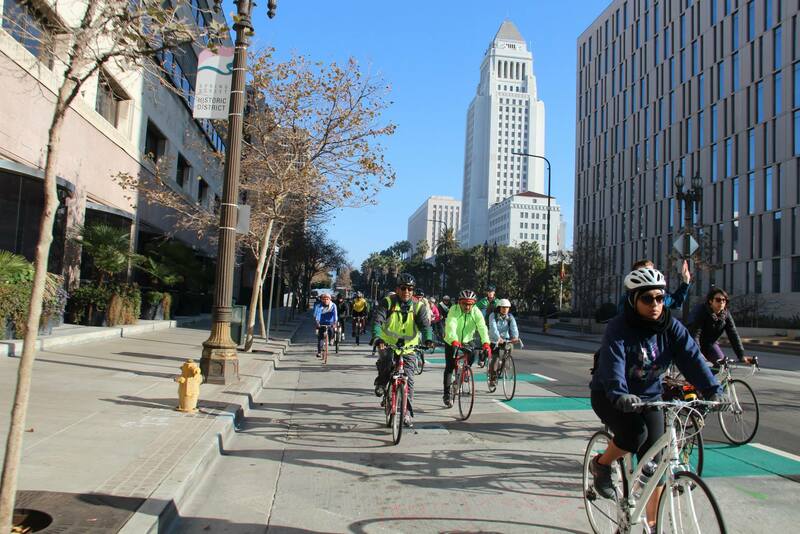 According to Bruins, Team Cedillo plans to do a weekend pop-up demonstration event for four blocks of Figueroa over an upcoming weekend as soon as March. What’s worrisome is that unlike the Great Streets initiative in other City of Los Angeles neighborhoods where the Mayor’s office has taken the lead, this particular project on Figueroa is being led by Cedillo’s office. If any of their previous efforts are an indication, the Great Streets initiative in Team Cedillo’s hands means that Highland Park’s Figueroa won’t likely get one. 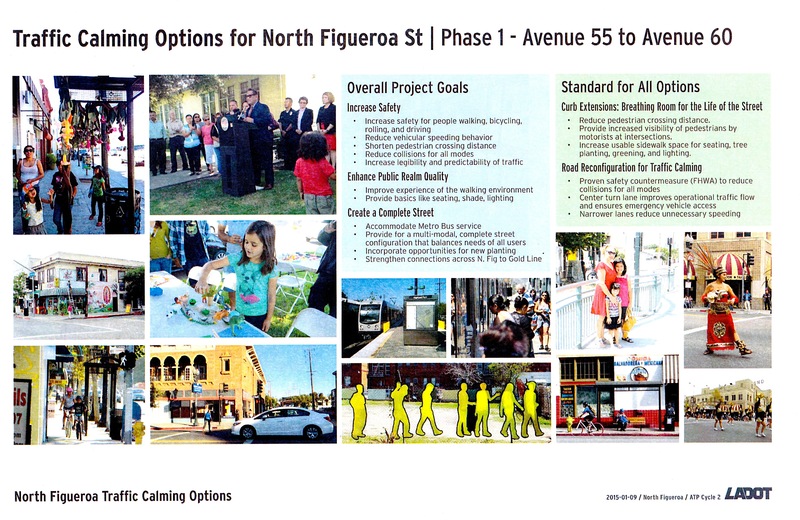 But the kicker of the evening came with Bruins’ news that Team Cedillo would like us to do outreach to Figueroa businesses and try and sell them on this street plan they are putting forth. (Again, this theme of absolute consensus that Cedillo keeps using as an excuse.) No surprise, the room with mostly veterans of this Figueroa battle, were not receptive to Eric Bruins proposal to do outreach for the CD1 office. It seems odd to many observers and activists that LACBC would be willing to work with Cedillo’s office considering their incompetency thus far, and how this project does little to help fulfill the 2010 LA Bike Plan that so many generations of LACBC members and staff worked for so many years to achieve. Is chasing incrementalism worth our trouble when all it takes is for ONE PERSON to sign a work-order that lets LADOT do their job? Maybe we are wrong, but has Team Cedillo done anything up to this point that shows they are worthy of our trust? We are understandably tired of being played. The question at this point is: Do we kowtow and put our energies into helping Team Cedillo’s attempt to get this doubtful State of California grant that could fund five blocks sometime after Late 2017? Or do we put our energies into replacing Cedillo with someone who will allow LADOT to complete the approved and already-funded pedestrian-friendly Road Diet and Figueroa Bike Lanes when he comes up for re-election in 2017? At 9:45pm on Friday, September 18th, pedestrian Yolanda Lugo, 51 was struck by a driver as she was walking in the crosswalk located at Figueroa and South Avenue 55 in Highland Park. The driver failed to yield, and fled the scene. After two days in intensive care, Yolanda Lugo lost her life on Sunday, September 20th. 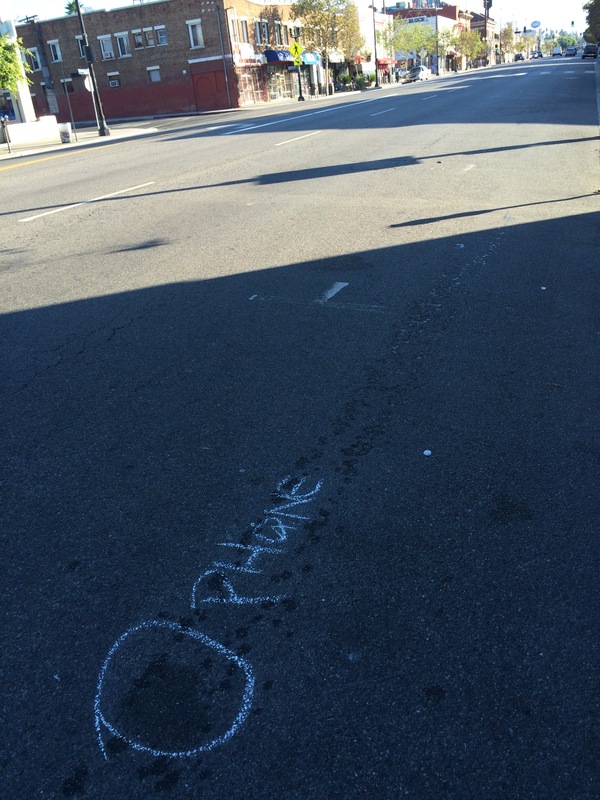 Bloodstains and the location where Yolanda’s phone landed on Figueroa. Memorial to Yolanda Lugo at the crash site, three days after her death. By Monday after Lugo’s passing, a couple of prayer candles and some flowers could be seen at the crash site. 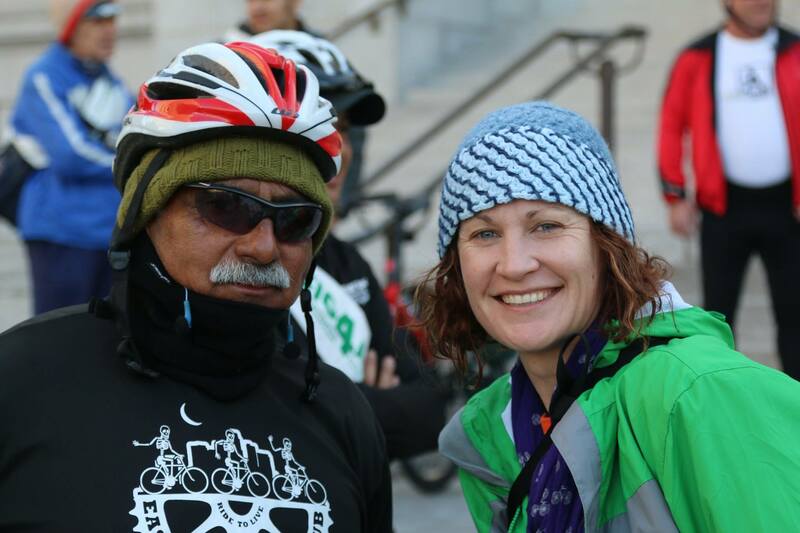 Word started to get out about her death and her family, with the support of the Highland Park community, began planning a demonstration and vigil for Lugo at the deadly Figueroa crosswalk on Friday, exactly one week after she was fatally struck. 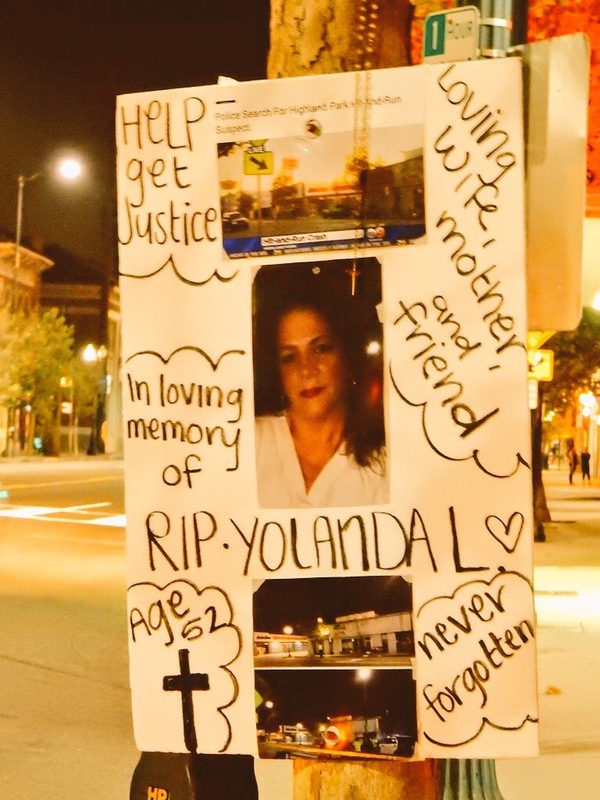 On Friday, September 25th, Fig For All joined the family and friends of Yolanda Lugo at Figueroa and Avenue 55 to vigil, demonstrate, and help raise funds to defray the cost of her medical bills and funeral. The night of the vigil and demonstration, a week after Lugo was struck and with the perpetrator on the run, Gil Cedillo had yet to acknowledge the event. 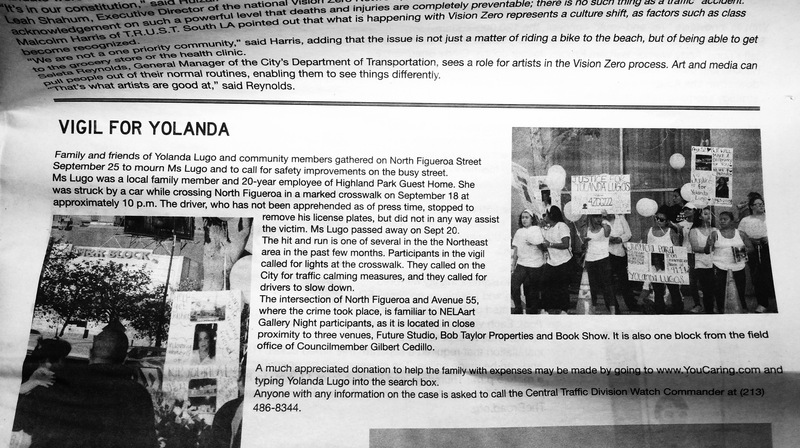 His Communications Deputy, Fredy Ceja only hinted at the road safety issue with a stop sign blurb in the unusually late publishing of the Cedillo Weekly. Two stop signs in all of Council District 1 were installed recently, both in Highland Park. One installed on Avenue 50 at Lincoln (thanks in large part to Team Huizar’s urging), and another at Marmion Way where it ends at Joy Street. (Yes, they took the opportunity to pat themselves on the back for getting a stop sign installed where a street ends.) It would not be until the next week before Cedillo would comment on the tragedy. 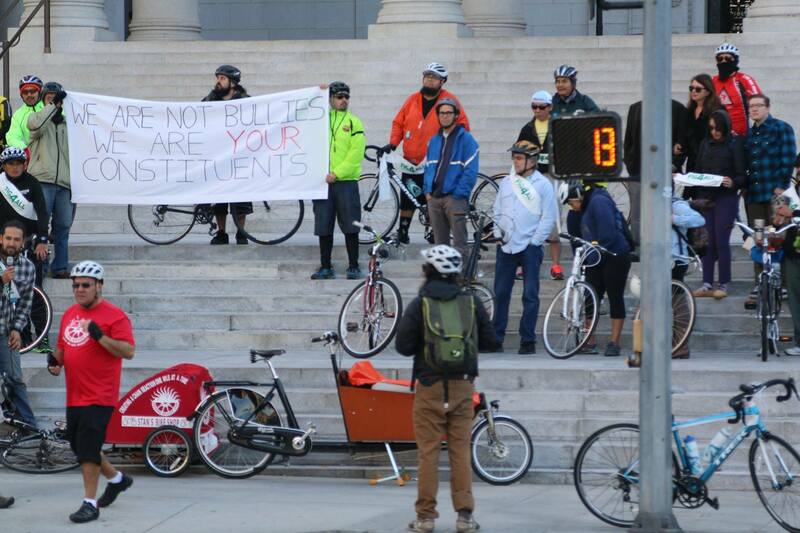 After calling on his office for eleven days, Cedillo finally made a public statement on this latest tragedy and uses the opportunity to scold safety advocates. While he was politically grandstanding, pacifying seniors, doing photo ops, making speeches, having to dinner with police, having dinner with business people, receiving rewards, and wishing his unqualified Planning Deputy a happy birthday, police and community members were lighting-up media outlets and the internet in an effort to get out the story about the hit-and-run and the vehicle involved. 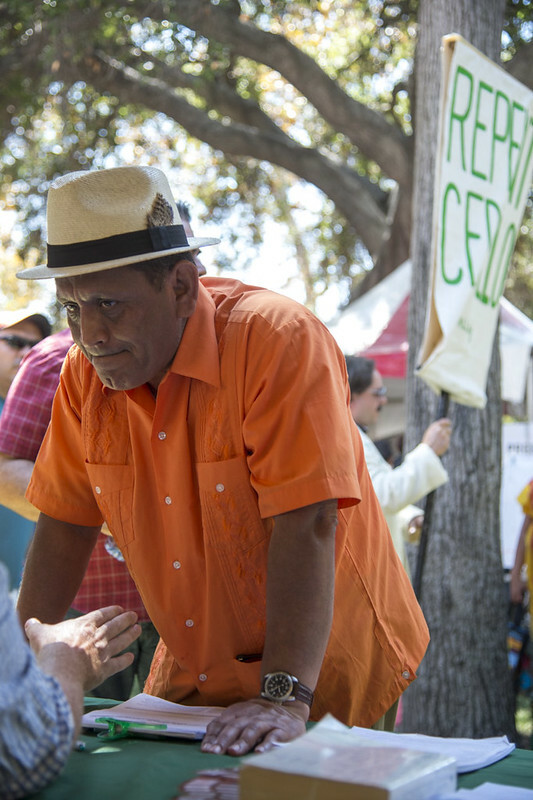 While Cedillo was accepting campaign contributions, the community was busy raising funds to defray Yolanda Lugo’s medical and funeral costs. In the time it took for Cedillo to get around to mentioning the hit and run one block from his Highland Park field office, the suspect could have walked from Figueroa to Bahía de los Ángeles, Mexico. If Cedillo really cared he would have been reaching-out to the victims, the police, and the community if not the day after, at least by the Monday after. But no, it took him eleven days, and only after community and media attempts at reaching him. When he does respond to this latest tragedy, he once again lashes-out at his critics for as he puts it, “Trying to turn this situation into a political opportunity.” Coincidentally, The Onion put out a story this week that works just as well for Cedillo’s scolding of safety advocates, “Man Can’t Believe Obama Would Use Tragedy To Push Anti-Tragedy Agenda.” Yes, Cedillo. We are as you say, “Trying to turn this situation into a political opportunity.” Yes, we will use this tragedy to push our anti-tragedy agenda. We want you to do the right thing, we want you to stop this ridiculous brinkmanship and allow LADOT to install safety enhancements. Just three weeks before Lugo was fatally struck on Figueroa, Mayor Eric Garcetti signed his Executive Directive making Vision Zero city policy. North Figueroa, the Deadliest Street in Northeast L.A., is well on its way to becoming the test-case for the city’s goal of reducing traffic deaths to zero by 2025. That aspect is explored in this story by Meghan McCarty at KPCC. At the same time as Los Angeles is trying to achieve Vision Zero, the State of California is trying to bring an end to its rampant hit-and-run epidemic. On October 2nd, both Eastern Group Publications, and La Opinión cover the Lugo tragedy with an emphasis on Assemblyman Mike Gatto‘s new law to create a Hit and Run Yellow Alert system for California. 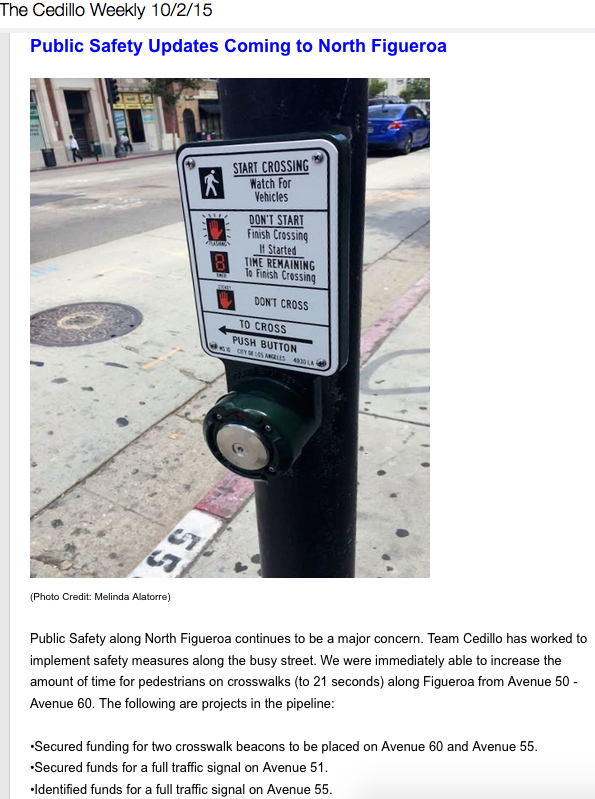 Meanwhile, still backpedaling driving in reverse, Team Cedillo miraculously “Secures” funding left over from the Reyes administration to install crosswalk signals on Figueroa. Highland Park CD1 Field Deputy, Malinda Alatorre’s tired picture of a beg button from back in May highlights the “Safety Updates” in the Cedillo Weekly e-Newsletter. Amazing how quickly they “Find funding” to do safety improvements AFTER someone gets killed by motorists around here. Remember, when they say, “In the pipeline” that means don’t expect anything to be done anytime soon. (At least not before the 2017 re-election campaign.) If you recall the, “No-I-Will-Not-Make-Figueroa-Safer-Because-Safety” letter from last July, he promised alternative roadway safety enhancements. None of which have been implemented. Reconfiguration, beacons, ramps, blah, blah, blah… Words are cheap aren’t they? 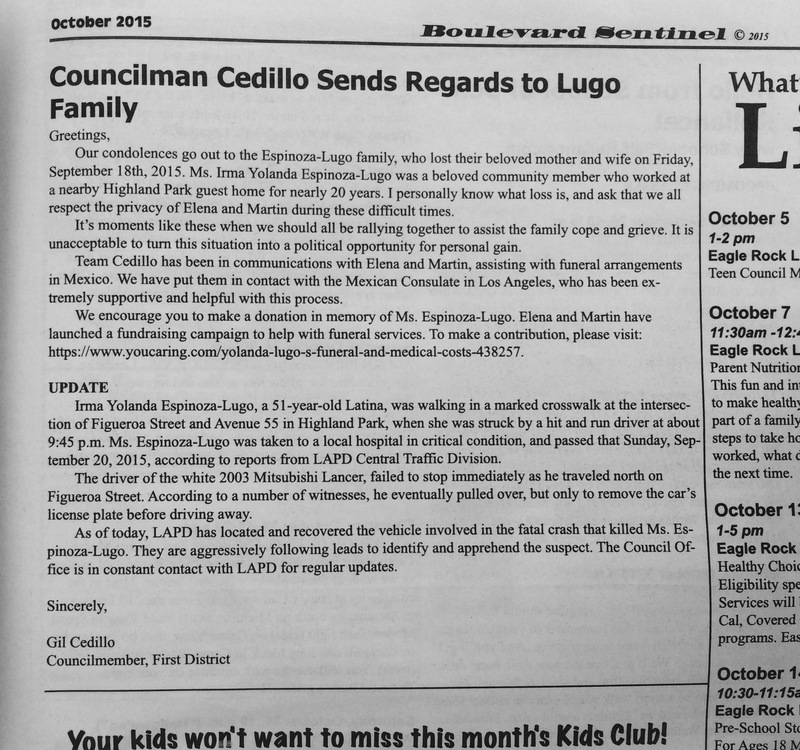 Boulevard Sentinel proves again to be just a mouthpiece for Cedillo. No story, just his letter. For years, Northeast Los Angeles has suffered from a pathetic lack of reliable news coverage. If there is fire, flood or blood in Northeast L.A., we might get coverage. (As of this post, TV news outlets that first reported the Hit and Run have not updated their stories from nearly a month ago.) The one local “Newspaper” we have isn’t even a newspaper, it’s a propaganda rag. Now-retired publisher, Tom Topping started the monthly publication over 18 years ago in an effort to save automotive businesses on Colorado Boulevard in Eagle Rock. New publisher, Colorado Boulevard hardware store owner, Tim Tritch seems to be keeping that same propaganda spirit. 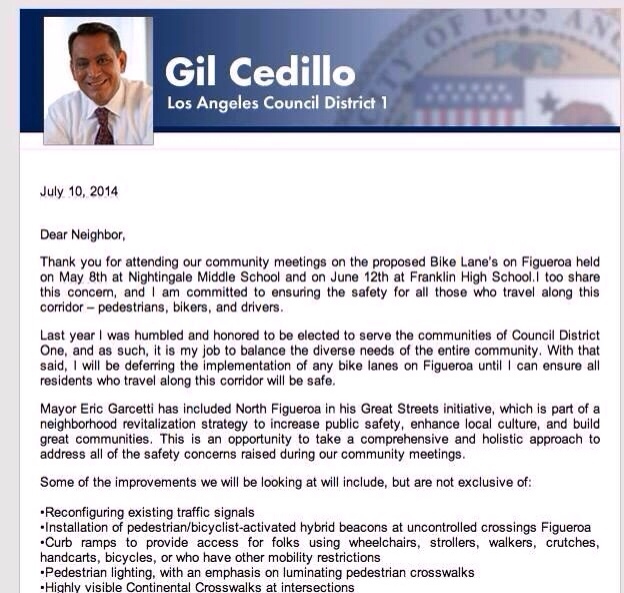 Instead of reporting the Hit and Run story and vigil, he just reprinted Gil Cedillo’s letter word for word. What’s worse is, Tim Tritch seems to like Cedillo even more than Tom Topping did. Even the local Arts newspaper, does a better job at reporting local news. See, this is news. Local news. But in an arts paper, because that is how desperate we are for news coverage. District Director, Conrado Terrazas mansplains to Yolanda Lugo’s daughter. Attaching protest balloons to the crack house gates of Cedillo’s office. CD1 Chief of Staff, Arturo Chavez, and District Director, Conrado Terrazas step out of the office to talk to Yolanda Lugo’s family. 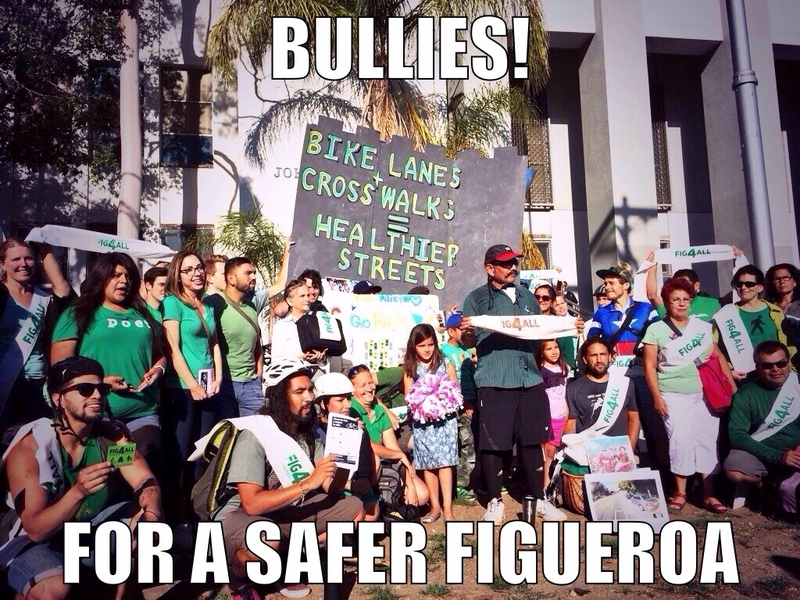 CD1 Chief of Staff finds the Lugo family’s demand for a safer Figueroa particularly amusing. After the Lugo family left, Team Cedillo removed the protest balloons and opened all the blinds. Chavez and Terrazas can be seen here behind the graffiti-stained CD1 office windows conferring. 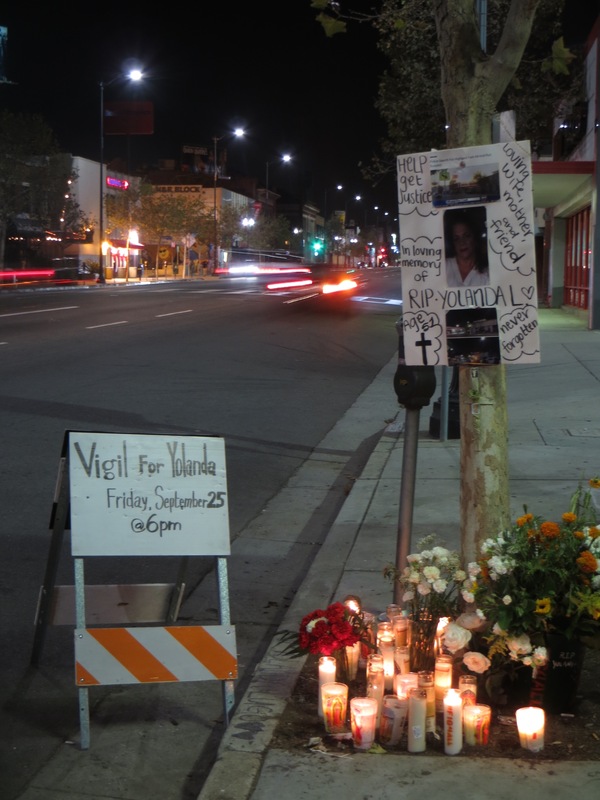 On Tuesday, October 6th, the family of Yolanda Lugo once again attempted to meet with the Cedillo staff at his Highland Park field office located on Figueroa, one block from the deadly crosswalk. Team Cedillo was gracious enough to meet them outside on the sidewalk. 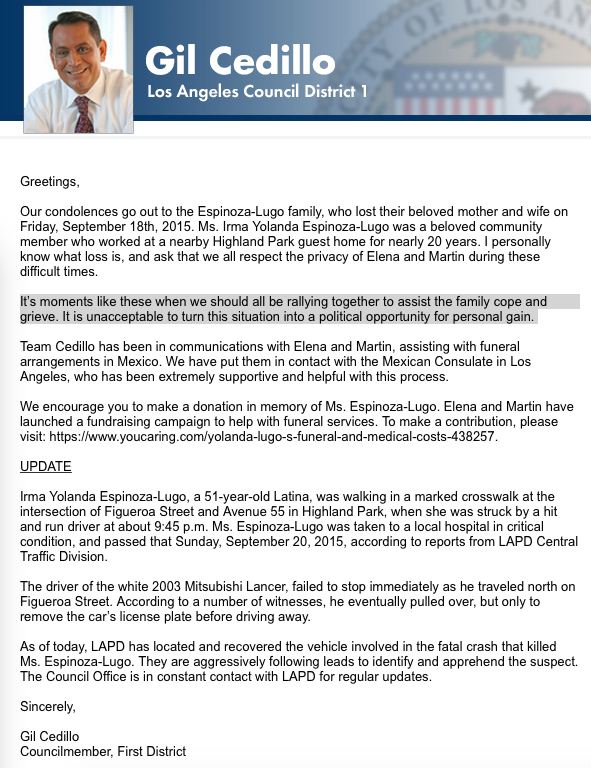 While District Director, Conrado Terrazas seem to take the family’s concerns more seriously, repeating the crossing lights promise, Chief of Staff, and Cedillo’s BFF, Arturo Chavez seemed to consider a family that just lost their sister / their aunt / their mother coming to ask for help A BIG JOKE. Going to Cedillo’s office, asking for help, and getting the run-around has become de rigueur for Highland Park residents and businesses. Their staff consists of interns, political supporters, and family friends of Cedillo. The hiring process isn’t so much what you know, but who you know, as in, “Do you know Gil?” Qualifying professional degrees and certification seems to be a rarity with them. This has led to a level of mind-numbing ineptitude that is outstanding even by Los Angeles standards. Their administration of CD1 after two years is one of reactionary responses. Never proactive, always trying to shift the blame and make up for their mistakes. A similar situation happened on Rowena Avenue in the more affluent neighborhood of Silver Lake in 2012. 24-year-old Ashley Sandau, was killed by a driver while using the crosswalk on what was then, a four-lane Rowena. The driver did the honorable thing and did not try to flee, so no manhunt was needed. Sandau’s death lead to CD4 council member, Tom LaBonge to order a road diet on Rowena that reduced the road from four multi-use travel lanes to two multi-use travel lanes, one turning lane, and made room to include two bicycle lanes. Pedestrians on Rowena Avenue no longer have to cross in front of four lanes of motor traffic and hope that every driver in every lane sees them. As much as impatient drivers complain, the road diet has made the road safer, and more pleasant for those who live, walk, and bike there. The problem is we live in Council District 1. We don’t deserve nice things. We don’t deserve the services, the infrastructure, the public safety, or responsiveness that other Los Angeles City Council Districts get. Our Council District 1 council member, Gil Cedillo is a career politician who has thrived on the poverty and desperation of his constituents that kept him in office. That has been his playbook since 1998. Team Cedillo thinks that they can outrun the criticism, that they can say, “We are working on it.” And the public will forget, stop asking and be distracted TV give-a-ways, or another one of his Latin Jazz festivals. Yolanda Lugo was struck in the crosswalk exactly where a north-bound buffered bike lane was supposed to be installed last year. It is very likely, she would have been in the buffered or bike lane area outside the travel lane where the hit-and-run driver was driving. Figueroa is a wrong-sized and unnecessarily-wide roadway that divides the walking and transit-oriented neighborhoods it passes through. Figueroa needs to be narrowed just as the Department of Transportation has planned. Crossing distances for pedestrians need to be reduced. Visibility for all road users needs be increased. 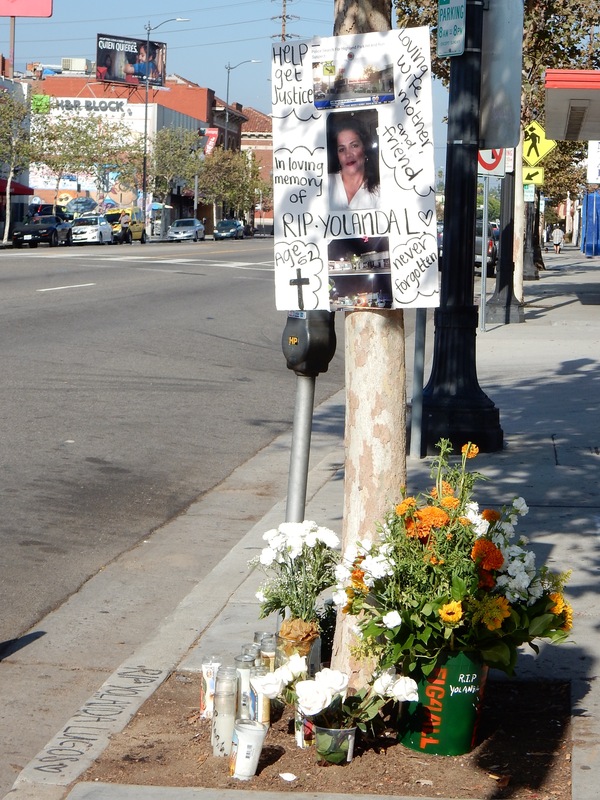 Until Figueroa is fixed, more people will continue to be injured and killed. The question is what number of deaths is Cedillo willing to accept? Lying on the cool asphalt in front of Canvas LA apartments, whistles and bike bells blasting at full volume all around me, looking up at the clear blue sky and screaming, “Chale con Cedillo!”, I couldn’t help but laugh. How had our lives taken this unexpected turn? The word “chale” is a slang term that is roughly equivalent to the English phrases “hell no” or “get out of here with that nonsense”. In the mid-1960’s Chicano activists organized a boycott of Coors beer; the phrase “Chale con Coors!” was used to rally support for the boycott. In a recent city council meeting (see the YouTube video above), Councilman Cedillo called a group of constituents members of “the 1%” and “bullies” for speaking out against Cedillo’s proposal to install diagonal parking on 4 blocks of North Figueroa Street in downtown Highland Park. 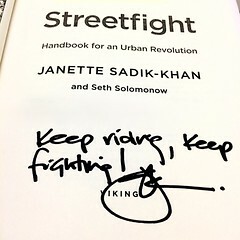 Cedillo’s co-opting the language of Occupy to portray his constituents as the spiteful global economic elite was outrageous. Calling the parents, business owners, residents, and NGO’s who’ve reached out to him “bullies” had a lot of normally level headed folks steaming with anger and frustration. Get rid of this diagonal parking plan? No, get rid of Cedillo! Chale con Cedillo! Organizing for Sundays protest began in earnest later that day. 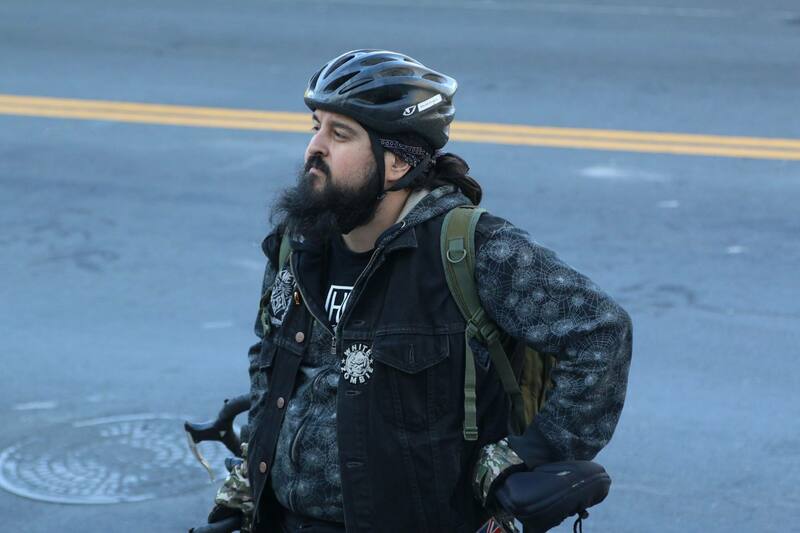 After leaving the Flying Pigeon bike shop on Sunday morning, the ride made its way down to a quiet City Hall. Our ranks grew to a little over 40 people while the banner reading “WE ARE NOT BULLIES WE ARE YOUR CONSTITUENTS” was unfurled facing Grand Park. Some speeches were made and photos were taken before the ride trundled through the 2nd Street tunnel; a bike pulling our PA system blasted Springsteen’s “Born to Run” as the ride howled like a pack of coyotes, looking for strength in our numbers as we emerged onto S. Figueroa. A quick right onto Beaudry and we were in front of the Canvas LA apartments, alleged home of one Gilbert Cedillo. Disregarding advice from insiders that the councilman merely paid the rent and collected mail at this address while living outside the district in a condo in Pasadena, we parked our bikes against the curb and raised hell. 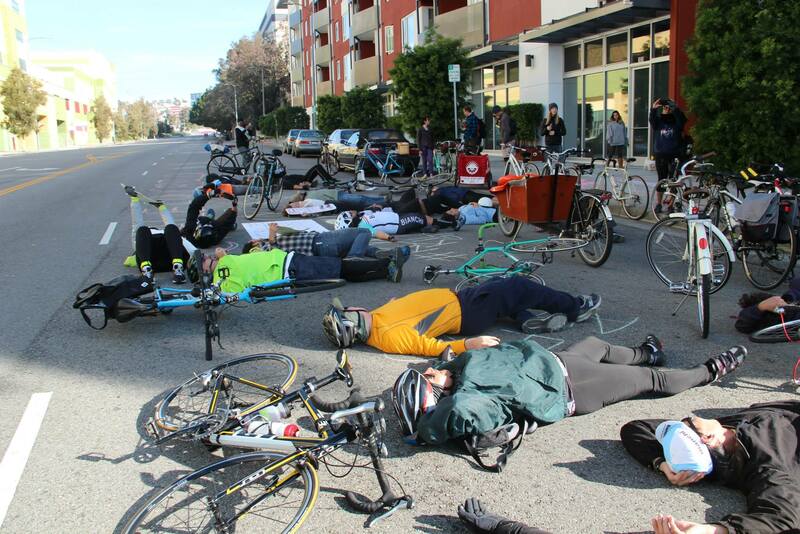 Our die-in was just about over when an LAPD cruiser pulled up and asked us just what, exactly, we were up to? A few minutes later we were going our separate ways: a diner, back home, the train, more riding. I made my way into Chinatown and bought $40 in take-out dim sum (that is A LOT of food!) and caught up with those choosing to have some brunch after our excursion. 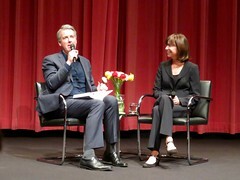 It was all smiles, as is typical at bike rides, parties, and protests in Los Angeles – why let the creeps get you down? Keep smiling in 2015 and don’t forget: Chale con Cedillo! Join your fellow bullies* at The Greyhound Bar & Grill on Tuesday, December 30th, from 6pm-9pm, as we say goodbye to a year of community activism and celebrate our dedicated resolve to create a North Figueroa that is safer and more hospitable to all users in the coming year. Wear your sashes! Metered Parking in rear; Metro Gold Line, Lines 81, 83, 256; LADOT Highland Park/Eagle Rock DASH bus, adjacent. LADOT bike rack equipped, (Sorry, no bike lanes). Happy Hour 4-7pm, 90042 Residents get 20% off with I.D., All Ages welcomed before 9pm. *Bullies as defined by Gil Cedillo, are people who oppose his plan to add more car traffic to Highland Park’s Figueroa. 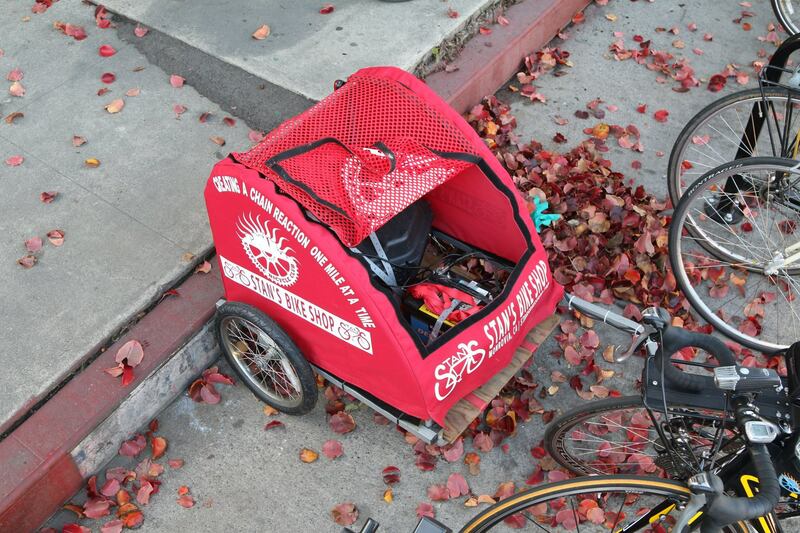 Figueroa For All is having a potluck at the Flying Pigeon LA bike shop (located at 3404 N. Figueroa St., Los Angeles, CA 90065) on Wednesday, November 26, 2014 at 6 p.m.
A couple of growlers from Eagle Rock Brewery and a little something from everyone to eat and we’ll have a lovely evening talking about the upcoming street safety meetings scheduled by Gil Cedillo (our local anti-bike councilman). 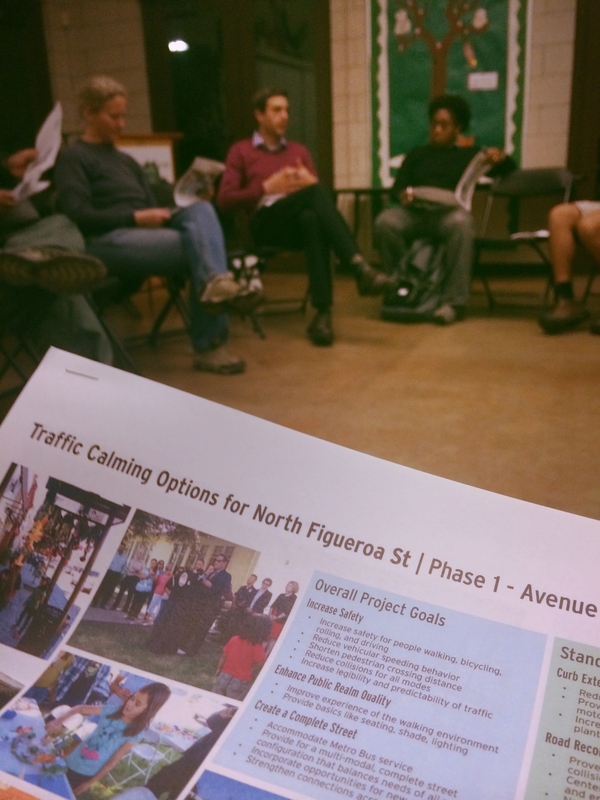 You can read more about those scheduled street safety meetings in a post published just this morning on the Flying Pigeon LA shop blog. Wednesday, November 26, 2014 at 6 p.m. at Flying Pigeon LA bike shop (located at 3404 N. Figueroa St., Los Angeles, CA 90065). It’s a potluck and Flying Pigeon LA said they are going to fill a couple of growlers up at Eagle Rock Brewery before the meeting. Good times to be had. “Close The Gap!”, they announce at the 710 freeway extension rallies. 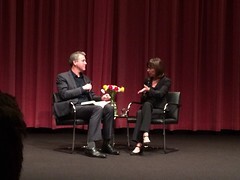 It is taken as gospel, by some, that connecting the 710 and the 210 freeways will create a magic nexus of “growth”, property value increases, and quality of life improvements – despite decades of evidence that urban freeways do exactly the opposite. This 528 foot gap between LA’s bike lanes and South Pasadena’s keeps our communities cut off to cyclists. Let’s talk about another gap: a gap between bike lanes in North East Los Angeles and South Pasadena. Three South Pasadena Public Works Commissioners (Steven Ray Garcia, Alexander Main, and Mathew M. Pendo) voted on November 13, 2013 to keep freshly installed bike lanes on Los Angeles’ York Boulevard from connecting to bike lanes on South Pasadena’s Pasadena Avenue … by a measly 528 feet! The cost to close this gap, at the time the vote was taken, was in the range of $4,000 – about what it costs for two hours of a lobbyist’s time on the 710 freeway closure. 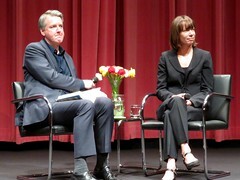 This decision also cost both Los Angeles and South Pasadena by continuing to stifle business foot traffic that would inevitably flow across a bridge connected with bike lanes – as shoppers, commuters, and day-trippers borne on bicycles would finally have a direct route between Highland Park and downtown South Pasadena. But hold on! We’re not finished yet with the gaps. Councilman Michael A. Cacciotti of South Pasadena has been working for years to connect the Arroyo Seco Bike Path (a short bike trail located in the Arroyo Seco’s riverbed) to a dirt foot path following the Arroyo Seco River up into Pasadena. 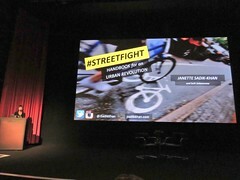 To make this recreational bike riders dream happen the councilman required land, money, and the City of Los Angeles’ permission. He’s got the land to connect to Pasadena – from the driving range that leased their property alongside the Arroyo in South Pasadena. He’s got the money – from Assemblymember Chris Holden of the 41st district (who has gotten $410,000 of the $1 million South Pasadena has amassed). What Councilman Cacciotti is missing is, funny enough, permission from the City of Los Angeles to run his bike trail across 528 feet of paved land under the York Boulevard bridge. I don’t care for the 710 gap closure – I think it’s bad business for the cities in the area that would have to deal with the pollution and decreased property values from yet another urban freeway. The South Pasadena to Highland Park Bike Gaps, however, are something many of us would like to see connected! How do we get the bike lanes on the York Bridge connected to the bike lanes on Pasadena Avenue, just 528 feet away? 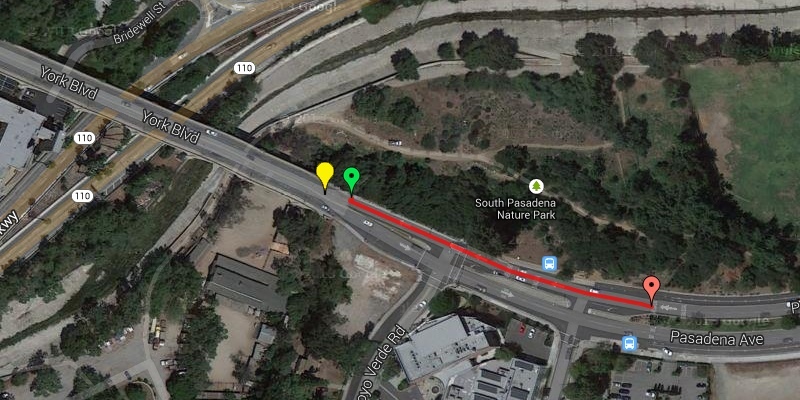 How do we get the City of Los Angeles to allow the City of South Pasadena to connect a bike trail from Pasadena to the Arroyo Seco bike trail? 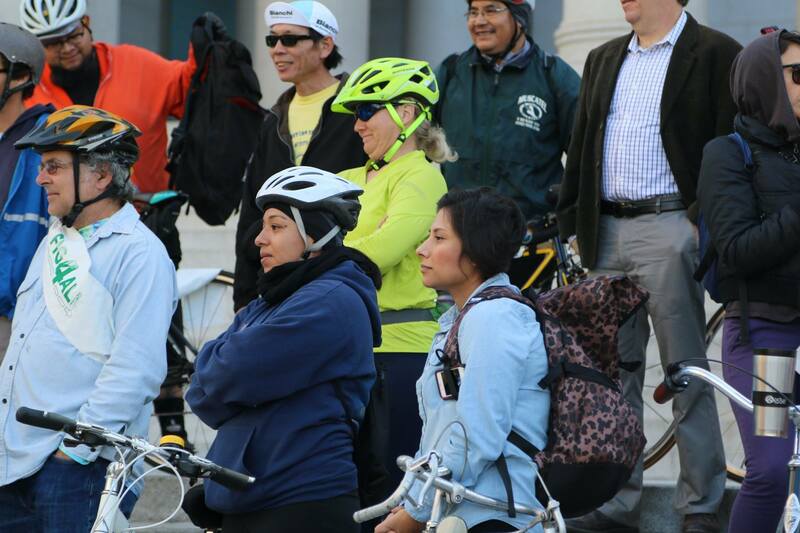 Tomorrow night, Wednesday, November 5, 2014, at 1424 Mission Street, South Pasadena, CA at 7:30 p.m., we can make public comments to the full South Pasadena City Council about closing the Bike Gaps. It’s not much, but it’s a start. Facebook Event for this get-together. If you’d like to submit an email on the topic, here is a special link that will CC: everyone that ought to know about closing the Bike Gaps!